A new year is a time for growth, change, development and progress. This is exactly what BilWrite, your campus connection for the improvement of English writing skills, is doing for 2008. Starting January 3rd, you can find BilWrite in their brand new location - Room 159 in G Building. It won't be long before you will see new posters and leaflets all around the university providing you with even more information on BilWrite, the new headquarters, and the services offered. 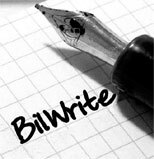 You can make appointments by writing bilwrite@bilkent.edu.tr, stop in, or call the new extension at 3111 - It's easier to remember than your favorite pizza delivery place! The BilWrite Team looks forward to seeing you in the New Year to help with your essays, statement of purposes, internship reports, CV's and any other English language writing assistance you may need!